Just in time for the new school year, Google has launched a tool called Classroom that aims to make teachers’ harried lives a little easier. Google started rolling out Classroom on Tuesday to all Apps for Education customers. More than 100,000 teachers in 45 countries signed up to test it over the past few months, Google said in a blog post. The goal is to help teachers “spend more time teaching and less time shuffling papers,” wrote Zach Yeskel, Classroom product manager. When it announced the product in May, Google described Classroom as a simple tool that teachers can use to create and organize assignments, provide feedback and communicate with students. It uses Apps for Education components such as Docs, Drive and Gmail. Google has made some modifications to the product since May based on feedback it received. “For example, we heard during the preview that educators don’t want to wait until an assignment is turned in to collaborate with students. Now, with Classroom, teachers can view and comment on students’ work to help them along the way,” Yeskel wrote. 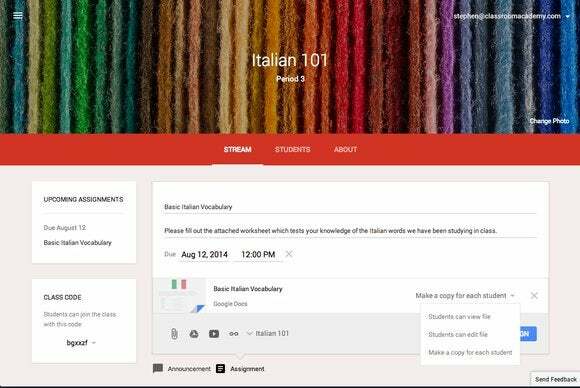 Google also added a section where teachers can post information about their classes in one place. Its decision to offer Classroom came as something of a surprise. At the time, Google hadn’t ventured onto the turf of education software vendors, instead relying on their products to add functionality to Apps for Education through the Apps Marketplace. Both Apps for Education and Classroom are free.